The subject of weddings at Carlisle Indian School recently came up in a conversation with the granddaughter of a Carlisle Indian School student. This subject hasn’t received much attention in the past. Sure, Jim Thorpe’s marriage to Iva Miller was a major national media event in its day, but weddings of non-celebrities or non-celebrities have received little attention since the actual events took place. Let’s take a look at one that might be more representative of student weddings. When addressing the incorrect assertion that Pop Warner had developed the single-wing formation while he was coaching at Pitt and Stanford in the 1920s by www.footballhistorian.com, I neglected to include a piece of evidence that demonstrates this statement is patently false. Below is a photograph of the 1915 Washington State College team lined up in an unbalanced-line single wing formation. The photo can be found on page 79 of Richard Fry’s beautiful book, The Crimson and the Gray: 100 Years with the WSU Cougars, which has unfortunately gone out of print. (Something needs to be done about that.) The identities of the players, uniforms and helmets accurately date the photo. Lone Star Dietz, a single-wing aficionado, coached WSC for the 1915-17 seasons, so it is logical that his team would run it and the double-wing. 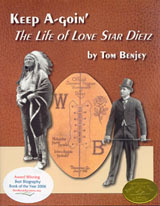 Dietz played on the Carlisle Indian School teams from 1909-11, then assisted Pop Warner from 1912-14. After the end of the 1914 season, Warner and Dietz headed to greener pastures. Warner took the head coaching job at Pitt and Dietz caught the train to Pullman. If Warner hadn’t developed the single-wing at Carlisle as he said, this photo would mean that Lone Star came up with it on his own and never took credit for it, which is highly unlikely. Some of the confusion may be of Warner’s making. Pop’s correspondence course (1908-11) and his first coaching book (1912) do not include this formation; they show earlier evolutions with balanced lines. The formation in the photo is the one Warner calls Formation A in his 1927 book. He likely held back his best stuff in his earlier publications because it is doubtful that Dietz would have been running the unbalanced-line single-wing as a primary formation in 1915 had it not been perfected used at Carlisle some years before. While researching the 1905 Carlisle-Massillon game for an article in an upcoming issue of the Professional Football Researchers Association’s (PFRA) journal, The Coffin Corner, I came across a statement in the late Robert W. Peterson’s Pigskin: the early years of pro football that caught my eye. Of course it has nothing to do with the article but it made me curious. Peterson wrote, “It was not sectional chauvinism at work when 129 out of 132 All-American berths between 1889 and 1900 were filled by players from those four schools [Harvard, Yale, Princeton & Penn]. The best players were really there.” I recalled that Carlisle’s first Walter Camp first team All-American was Isaac Seneca in 1899. If Peterson was accurate, that would put Seneca and the Carlisle program at a lofty level. 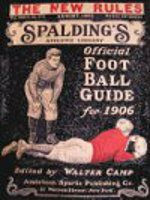 The Walter Camp website lists all of his All-America teams beginning in 1892 when he created the concept of such a team. Sure enough, all the players named were from the Big Four until 1895 when Cornell’s Clinton R. Wyckoff was named to the team. The next non-Big Four player to be named was Clarence B. Herschberger of Chicago in 1898. Seneca became the third in 1899. The fourth was William Morley of Columbia in 1900. Whether Peterson was right depends on the meaning of between. Does between include the 1900 team? Things changed a lot in 1901 when four outsiders were selected: two from Army, one from Cornell (Pop Warner’s younger brother) and one from Columbia. In 1902, Paul B. Bunker of Army, a repeat from the previous year, was the only non-Big Four player on the list. And in 1903, Carlisle had its second All-American in the person of James Johnson. H. J. Hopper of Dartmouth, Willie Heston of Michigan, and Richard Smith of Columbia were also on that team. I received some great news over the weekend– Oklahoma’s Carlisle Indian School Immortals have shipped and should be available for sale and immediate shipment by mid-week at www.Tuxedo-Press.com and next week from other booksellers. This book is not recommended for people who already have Doctors, Lawyers, Indian Chiefs because most of the material in the new book can be found in it. This may not sound like it makes sense, so I’ll explain. 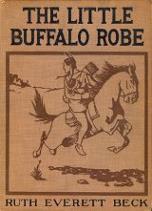 Doctors, Lawyers, Indian Chiefs, in my opinion, contains a lot of information that is of interest to young people. However, at 160,000 words, it is inaccessible to youngsters. As an aside, adults tell me they don’t necessarily read it in sequence because its organization allows readers to skip around, reading sections or chapters they find interesting at a particular time and others at other times. 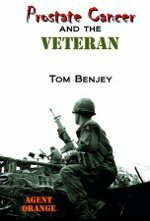 Still others use it as a reference book because most of these men’s life stories have been told nowhere else. By splitting this book into a series by state, each volume is short enough that children can read it. A benefit to me is that I was able to include two people who weren’t in Doctors, Lawyers, Indian Chiefs: Mike Balenti and Henry Roberts. Perhaps when I finish the series I will make a second edition of Doctors, Lawyers, Indian Chiefs that includes all the new people that were added in the series. Also, Oklahoma’s Carlisle Indian School Immortals is in hardback with a glossy cover, something that should make it an attractive Christmas gift, particularly for children with roots in Oklahoma. If it sounds like I am on a soapbox, it is because I am. Our children and grandchildren should know about these people and much of what has been written about Carlisle Indian School is distorted at best. While researching the 1905 Carlisle-Massillon game for an article in an upcoming issue of The Coffin Corner, I noticed that Chauncey Archiquette played in that game. I hadn’t previously realized that he was back in a Carlisle uniform in 1905, but he most definitely was. That line-ups in newspaper coverage of games played that year generally include his name support that fact. In Steckbeck’s Fabulous Redmen, the line-ups for the 1904 Carlisle-Haskell game are on the page opposite the beginning of his discussion of the 1905 season. I noticed that Archiquette was in the line-up for that game as well. However, he wore a Haskell uniform. A look into Archiquette’s file showed that, after graduating from Carlisle in 1899, Chauncey had enrolled in a commercial course at Haskell. Newspaper accounts of Haskell games indicated that he had indeed played football for Haskell. This also explains how Archiquette happened to be at Haskell where, among other things, he became a young Jim Thorpe’s idol. Few Carlisle players played against their old team after leaving the school. James Phillips, for example, refused to suit up for Northwestern in 1903 when they played the Indians. Instead, he watched the game from the stands. Joe Guyon is a notable exception in that he played in the humiliation of the hapless 1917 squad. He started the game but played just a little more than a quarter in which time he scored two touchdowns. 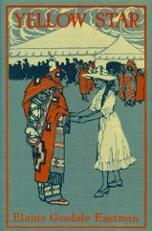 Archiquette joined that small group in 1904 when the two Indian schools met for the only time. Steckbeck marked nine Haskell players’ names with asterisks to denote that, after the 1904 thrashing, they “later enrolled at Carlisle.” It is worthwhile to note that Pop Warner was not at Carlisle for neither the 1904 season when the game was played, nor for the 1905 and 1906 seasons when many of the players transferred. The page is very attractively done and has links to sister sites for baseball and basketball. The problems start when you read what is written on the site. The title for the article is Single-Wing Formation…1920s. I found it curious that the single-wing was filed under the decade of the 1920s instead of when it originated. 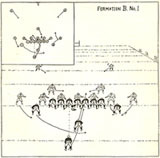 The first sentence of the article explains that: The single-wing formation was conceived by Glenn “Pop” Warner while coaching at Pittsburgh and Stanford Universities. After reading this, there is little point in reading further. Apparently, the writer has not read Pop Warner’s letters, books and articles about when he originated the single-wing. As long-time readers know, I researched the birth of the single-wing a couple of years ago and found something quite different from what FootballHistorian.com wrote. To my knowledge, I am the only person to have located the different versions of the offense pamphlets from Warner’s correspondence course that pre-dated his 1912 book. www.Tuxedo-Press.com reprinted Warner’s single-wing trilogy which consists of the 1912 and 1927 books plus the various versions of the offense pamphlet that could be found with an introduction to explain them a bit. Anyone interested in learning the history of the single-wing would enjoy reading them. I attempted to navigate the site but was unable to find an email address to contact. I did find a Jim Thorpe page. He states that Thorpe “…simply outran the opposing defense and chalked-up a phenomenal total of 1,869 yards in only 191 carries.” I don’t do stats; that’s Tex Noel’s department, so I will leave that up to him. Apparently, he didn’t read what opponents had to say about tackling Thorpe. After discussing the 1912 football season, he wrote, Thorpe then was acclaimed “the best in the world” by winning Gold Medals in the 1912 Olympics in both the decathlon and the pentathlon in Stockholm, Sweden. This gives the reader the impression that the Olympics happened after the football season. Hmmm. George Gardner’s granddaughter sent me a scan of a photo of the 1908 Carlisle Indian School band. George’s brother, William, was better known than George due to his exploits on the football field, the sidelines and alongside Eliot Ness. However, George was quite active at Carlisle and also played on the football team. In the photo below, he is in the second row from the top, third from the left. George’s great-grandson doesn’t think the flag in the photo is a 1908 flag. My eyes aren’t good enough to determine whether it is or not. On Saturday, November 16, 1908 the areas that had previously been known as Oklahoma Territory and Indian Territory were admitted into the union as our 46th state. The flag necessarily changed as a result because a star was added. Below are images of the 45-star flag that was used from 1896 to 1908 and the flag that was used from 1908 to 1912. My eyes aren’t good enough to determine which is in the photo, so I did a little detective work. This photo appeared on the front page of the January 31, 1908 edition of Carlisle’s school newspaper, The Arrow. The photo does not appear to have been taken in the winter. The photo had to have been taken before January 31, 1908 and in good weather. Therefore, it was likely taken when the flag had only 45 stars. Perhaps someone with sharper eyes or a higher resolution photo can prove me wrong. Keep in mind that US flags never expire. It is always proper to display an older version of the flag provided it is in good shape. Proofs for the text and cover of Oklahoma’s Carlisle Indian School Immortals arrived Thursday. The purpose of the proof is to determine that everything is perfect before printing the batch of books. The cover looks great to me. The colors are vibrant and Bob Carroll’s drawings of the players’ faces provides an attractive background for the text on the back cover. There is a problem with the text, however. Rather than taking up space in the narrative with dry demographic about the players, I put this information in boxes, one for each player. The boxes were shaded in light gray for visual interest. Herein lies the problem. Five of the fifteen demographic data boxes appear to have no shading. The boxes looked perfect in the advance reading copies (ARCs), but those were produced by a different printer. Panic set in immediately. The PDFs sent to the printer look perfect. The printer’s technician informed us that the shading was done at 9% and they accept nothing below 15%. That doesn’t answer the question as to why two-thirds of the boxes were shaded correctly. As it turns out, the boxes that printed correctly have graphics with transparency on the same page but the bad ones don’t. It appears that the printer’s software or equipment does something different in these cases. Be that as it may, I have to submit new PDFs with 15% gray shading. That means that I will probably have to pay the graphic designer for his time and the printer fees for resubmitting a new PDF and for a new proof. I also have to wait several days to see if this solves the problem.